The first time I ever heard of Christmas cake was in 1992, a few months after I arrived in Japan. I went to visit a Japanese friend in Yokohama two days before Christmas. After she and her mother picked me up at Shin-Yokohama station, she said excitedly, “We're going to the bakery to get a Christmas cake!” I had no idea what she was talking about, but pretended to be excited about it, too. (After all, it's not hard to get excited about anything involving cake.) Later in her kitchen, she untied an elaborate red bow atop a cake box, pulled out this beautiful cake adorned with strawberries and started putting birthday candles on it. “Oh, is it your mother's birthday?” I asked. She gave me a strange look and said, “Um, it's a CHRISTMAS cake.” After dinner, she lit the candles and asked me to sing “Silent Night” with her. I was horribly confused at this point and trying very hard to be a good guest, so I did what I was told. The embarrassment and confusion disappeared as I took a bite of one of the fluffiest, most delicious cakes I had ever tasted. And ever since that time, I've had to tell students over and over again that Americans don't really eat cake for Christmas. I'm always surprised how many people seem to think that this is also an American Christmas tradition. When I was a child, Christmas was all about rolling out cookie dough, cutting them into shapes, and decorating them. 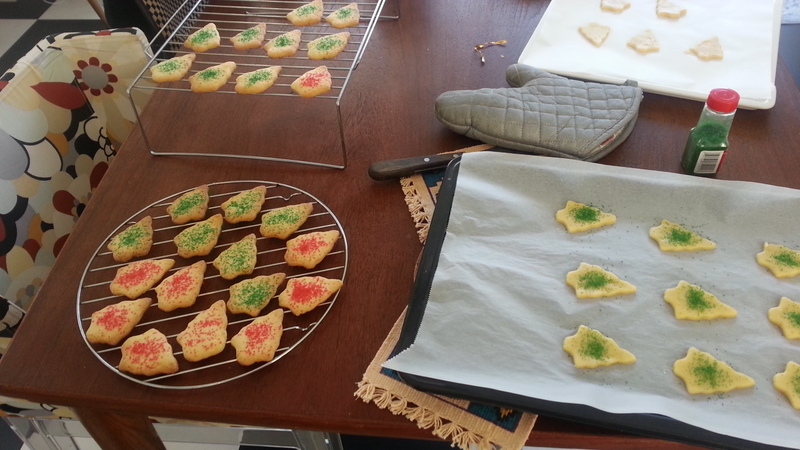 So, every Christmas I take the time to make cookies for my students so I can share my childhood memories of Christmas.